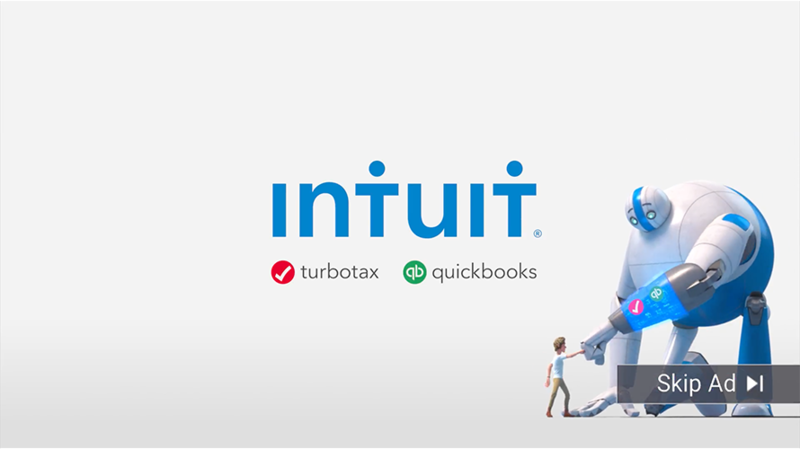 Intuit is making its Super Bowl debut with a 15-second spot from agency of record Phenomenon and Passion Animation Studios. Intuit’s campaign represents something of a reversal of the typical approach to using a Super Bowl ad, in which online components are designed to feed an attention-grabbing Big Game ad. In this case, the brief Super Bowl spot is meant to intrigue viewers enough to check out a longer online ad that already debuted, while also communicating its message about saving viewers time and reminding them that Intuit is the company behind both QuickBooks and TurboTax. Intuit is also running a Super Bowl ad for the latter brand by Wieden + Kennedy, the brand’s fifth consecutive Big Game ad. Intuit isn’t the first brand to make use of the “Skip Ad” button in its advertising. The London office of The Martin Agency launched a spot for Barclays last May featuring a Rube Goldberg machine triggering the button, while the agency’s previous “Crushed” and “Unskippable” campaigns for Geico similarly played on the idea of working against a limited time window.